Assistance handed out to low-income families, Orang Asli communities, orphans, single mothers, refugee and undocumented communities, among others. Kuala Lumpur, 6 July 2017 – In the Pahang hinterland, the Orang Asli community of Kampung Buloh Nipis, Muadzam Shah is hard at work preparing a communal meal for iftar with friends and families. The communal meal is funded by Yayasan Sime Darby (YSD) and organised by Islamic Relief Malaysia (IRM), and it is much welcome in a community that is in need of assistance. The villagers earn a meagre salary working in oil palm plantations surrounding the village. Some are senior citizens living alone, as their children work in larger towns and cities building their own lives. Saadiah Abdullah, 68 years old, lives alone in Kampung Buloh Nipis as her two children work in nearby towns for a better life. “I am so thankful for this assistance. My children are away working and they come to visit me during special occasions such as Hari Raya Aidilfitri. They would like how the house looks now very much,” she said when met at her home on 3 June 2017. IRM and YSD volunteers cleaned Saadiah’s house and fixed new curtains for her humble home. She received a box filled with necessities such as coffee, tea, sugar, salt, canned food and other food items, as well as a bag of rice. She also received a set of containers to be filled with kuih raya, glasses and a jug as well as a hamper full of goodies such as kuih raya, drinks and chocolates. 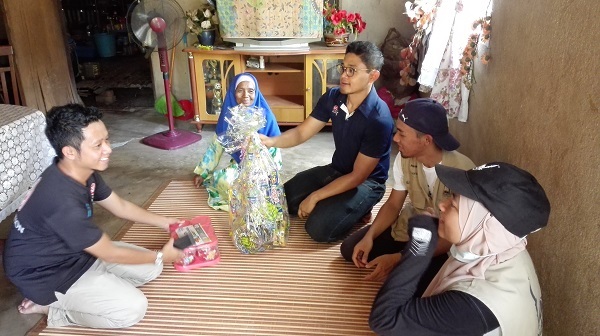 Saadiah was among six families in Kampung Buloh Nipis who received similar assistance where the volunteers helped to clean their houses and donated several items in preparation of Aidil Fitri celebrations. In addition, IRM and YSD volunteers also handed out food items to 100 low-income families in the village. Next, IRM, YSD and 40 volunteers from Sime Darby Group visited Kampung Permatang in Kuala Selangor to distribute food necessities to 100 families. Volunteers painted the Kampung Permatang Mosque and cooked bubur lambuk for iftar that was distributed to residents in the area. YSD handed out RM45,300 worth of food items to the 200 underprivileged families in Kampung Buloh Nipis and Kampung Permatang. In total, YSD distributed RM182,270 worth of food items, Tesco vouchers and duit raya to about 7,000 individuals across various target groups such as low-income families, Orang Asli communities, orphaned children, single mothers, refugee and undocumented communities, people living with HIV/AIDS, and the disabled community. Aside from IRM, YSD worked with Charity Right Malaysia, Jabatan Kemajuan Islam Malaysia (JAKIM), Yayasan Perdana Ummah (YPU), Maahad Tahfiz Masjid Al-Ridhuan and the Persatuan Komuniti Usahawan Selangor (PIKUS) to deliver the assistance to these communities. YSD Chief Executive Officer Hajjah Yatela Zainal Abidin said the Sinar Harapan festive assistance is in line with the Foundation’s commitment to assist those in need and make their festivities as meaningful as possible. “We are humbled and blessed with the opportunity to host more community events this year to provide us a platform to give out more charity in the holy month of Ramadhan,” she said. “I pray and hope that our assistance, no matter how small, will make a difference in their lives by lifting some of their burden, and bring festive cheer to them and their families,” she added. Sinar Harapan is YSD's flagship programme to assist underprivileged communities with various critical needs. Sinar Harapan, which receives a yearly allocation of RM1 million, includes providing school supplies to underprivileged children in the ‘Back to School’ programme and food assistance to underprivileged communities; aside from assistance during other festivities such as Chinese New Year and Deepavali. Under the Community & Health pillar, YSD to date has committed RM114 million towards community-based programmes, initiatives, advocacy and research efforts targeted at increasing the well-being of disadvantaged people, reducing socio-economic disparities as well as enhancing the welfare of neglected children, senior citizens, vulnerable women, physically challenged individuals and other marginalised groups.